Following up on an earlier post, here is the Drager PointGard 2000 Series literature for your convenience. 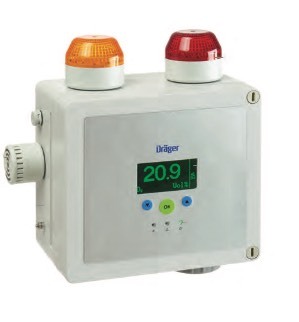 Drager PointGard 2000 Series Gas Detection System from Flow-Tech, Inc.
and maintenance of rupture discs. Rupture discs are fixed setpoint devices designed to provide failsafe performance in venting gases or liquids in the case of excessive pressure. The precision made and certified disc is contained within a holder specially designed for the disc and to facilitate proper inspection and maintenance. An integral part of the inclusion of a safety device in a process system is the manner in which it is installed. Documented product performance, upon which the user is depending, is predicated upon installation in a manner which duplicates the rating condition. Varying from the manufacturer's installation procedure or instructions can have an impact on the performance of almost any process measurement and control product, but adherence to procedure is especially important when safety devices are concerned. The video below demonstrates the proper procedure for installing Fike rupture discs. Fike provides certified rupture discs to meet all applications for process industries including isolating pressure relief valves from corrosive materials, reducing involuntary emissions, insuring pressure relief in critical applications, rupture discs for sanitary/pharmaceutical processes. Share your over-pressure safety requirements with a product specialist and select from the complete line of cost-effective rupture discs, holders and custom pressure relief devices which are compliant with global code regulations and designed to meet or exceed industry requirements for performance, reliability and quality. To an untrained ear, the term "vortex flowmeter" may conjure futuristic, potentially Star Wars inspired images of a hugely advanced machine meant for opening channels in warp-space. In reality, vortex flowmeters are application specific, industrial grade instruments designed to measure what may be the most important element of a fluid process control operation: flow rate. Vortex flowmeters operate based on a scientific principle called the von Karman effect, which generally states that a fluid flow will alternately shed vortices when passing by a solid body. "Vortices" is the plural form of vortex, which is best described as a whirling mass, notably one in which suction forces operate, such as a whirlpool. Detecting the presence of the vortices and determining the frequency of their occurrence is used to provide an indication of fluid velocity. The velocity value can be combined with temperature, pressure, or density information to develop a mass flow calculation. 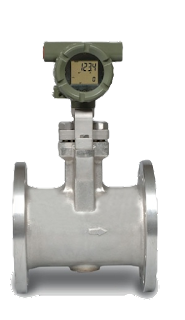 Vortex flowmeters are reliable, with no moving parts, serving as a useful tool in the measurement of liquid, gas, and steam flow. 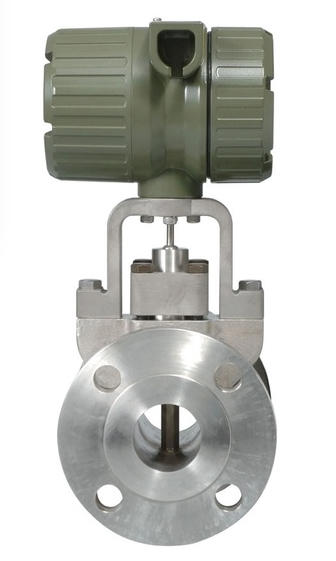 While different fluids present unique challenges when applying flowmeters, stream is considered one of the more difficult to measure due to its pressure, temperature, and potential mixture of liquid and vapor in the same line. Multiple types of steam, including wet steam, saturated steam, and superheated steam, are utilized in process plants and commercial installations, and are often related to power or heat transfer. Several of the currently available flow measurement technologies are not well suited for steam flow applications, leaving vortex flowmeters as something of a keystone in steam flow measurement. Applications where the technology may face hurdles include flows of slurries or high viscosity liquids. These can prove unsuitable for measurement by the vortex flowmeter because they may not exhibit a suitable degree of the von Karman effect to facilitate accurate measurement. Flow measurements can be adversely impacted by pulsating flow, where differences in pressure from the relationship between two or more compressors or pumps in a system results in irregular fluid flow. In industry, the assessment and control of risk factors is a crucial element of process control. Commanding risk allows not only for peace of mind regarding environments involving hazardous materials, but also ensures ñ and prioritizes - the safety of those who work with said materials. Fixed point gas monitoring tracks and repeatedly evaluates the levels of potentially toxic or flammable gases in an industrial environment, typically using electrochemical, infrared, or catalytic bead sensors. A central monitoring station allows for an entire facility to operate under consistent watch, as the array of gas monitors throughout a facility form a system. Typical environments which utilize fixed point gas monitoring include CNG filling stations, fleet maintenance buildings, wastewater lift stations and treatment plants, pipelines, and refineries, among others. Due to the variation in facilities and associated industrial purposes, the applicability and customization of fixed point monitors must be adaptable. The gases typically monitored by fixed point systems are industrial staples. Natural gas (methane) and hydrogen are inherently dangerous to work with due to both their combustible nature and flammability. 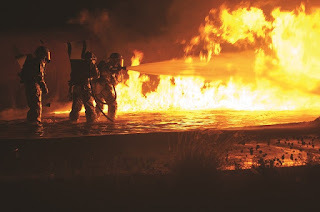 Carbon monoxide, hydrogen sulfide, and chlorine are especially dangerous to those who work in and around facilities where they are used or produced, while otherwise harmless gases such as nitrogen can cause oxygen displacement leading to asphyxiation. Around-the-clock is the only way to monitor and mitigate the potential impact of such volatile substances; thanks to automation, the ability to be constantly vigilant of threats related to gases is possible. Sensing and evaluating these types of gases is a complex process, yet one which also showcases the powers of the associated technology. International certification standards like ATEX (derived from a French regulation acronym) and SIL (the safety integrity level) allow designers of gas detectors to match their products with the necessary parameters to ensure safe working environments. For example, one manufacturers electrochemical gas sensor operates based on a principle involving two electrodes; the first electrode senses the toxic gas, and then the second electrode receives protons generated by the sensing electrode through an ion conductor. Output current which flows to an external circuit is proportional to the concentration of gas, therefore the current generated is measurable as an indicator of gas levels. Despite the fact that these sensors are primarily used in industry, there is also the potential for domestic applicability, automotive process control, and air quality control, among other uses. The different technological and practical applications of fixed point gas monitors allow for industry professionals to safely and capably navigate working environmental hazards for personnel and process protection.